This is a trailer for Friend Request. It was written by Matthew Ballen, Philip Koch, and Simon Verhoeven, directed by Verhoeven, and stars Alycia Debnam-Carey (Fear the Walking Dead), Brit Morgan (Supergirl), and William Moseley (The Royals). It is scheduled to be released on September 22, 2017. Check out the synopsis and trailer below. 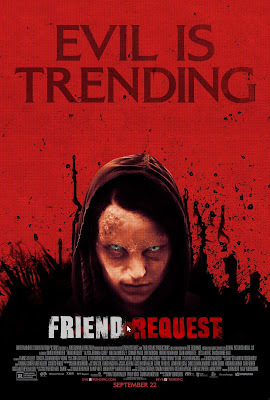 "Popular college student Laura (Alycia Debnam-Carey) has tons of friends, both on Facebook and IRL. She graciously accepts social outcast Marina’s (Liesl Ahlers) online friend request, until Marina crosses the line and Laura unfriends her. To everyone’s shock, Marina takes her own life in a ritual meant to torment Laura, which appears in a video posted on Laura’s profile. Even though it wasn’t Laura who posted the video, or other creepy content that begins appearing on her page, her Facebook friend count begins to dwindle as a result. When her real-life friends start dying mysterious, cruel deaths, Laura must figure out how to break the deadly curse before it’s too late."